Gearing up for this year’s event, the fifth under the organisation of Tenby Sea Swimming Association, the hope is that this stunning weather stays with us through the Summer. However, from the swimmers’ perspective, calm waters and minimal wind are more significant than sunshine. Noticeably more people are swimming in the sea as the heatwave continues; perhaps that will provide for an increase in endurance swimming, thus future event entrants. Certainly there are more sea swimming events than before, with Tenby hosting the Long Course Weekend’s Wales Swim, Wales Ironman and, the latest off the block, Tenfoot Swim (from Tenby to Saundersfoot). But there is only one Caldey Swim, truly open sea swimming, crossing the straits between Caldey Island and the mainland, finishing at Tenby harbour. There is only one swim requiring ferries out to the start, on Caldey’s Priory Beach. As we draw nearer this year’s swim, we hope your training is on schedule and your swimming as enjoyable as you’d like. We, meanwhile, look forward to welcoming you on 12th August. Oh, and by the way, we still have a few places left …. The swim will start at 12.45 from Priory Beach, Caldey, so swimmers’ boats will leave at 11.45. Registration on the day from 09.30. Online entry applications NOW available here: www.Tenby-Caldey-Swim.co.uk/SWIMMERS. 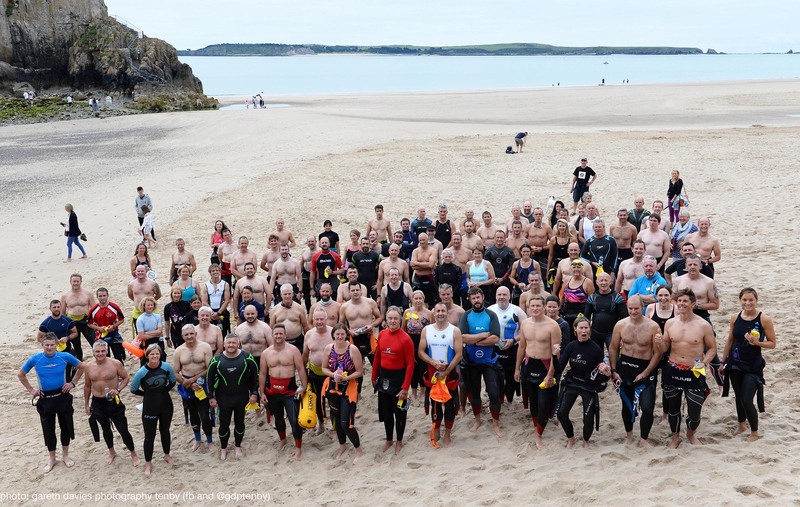 In 2015 the annual Caldey Swim – from Priory Beach, Caldey, to Tenby harbour – was cancelled because of unfavourable conditions – an easterly wind and choppy water, so there was even more expectation attached to this year’s swim. Come the morning of Sunday 14th August 2016, the conditions were nigh on perfect – a southerly wind of only 4mph to follow the swimmers along the largest section of the swim, parallel to Tenby’s South Beach, and warm, but cloudy skies, so not too hot. most looking happy, some concerned – nerves were playing a part and quite rightly: this is no ordinary swim, it is across the straits running between Caldey Island and Tenby, where the rip can take a person to Pendine instead if you start in the wrong direction and the tides haven’t been carefully considered. It is never a straight line swim! No local triathlete Oli Simon to lead the swimmers home this year – he was being a Dublin Ironman – so the normal 42-ish minutes to complete the challenge was only a guide. Indeed, the first finisher, Andrew Wallace, came home in 53 minutes, shortly followed by two others. So no record here. However, the two hours cut off has previously been a tight call for the last to finish, but not this year: all 94 completed the course within 90 minutes. And after some recovery time with a banana and a bottle of water, all were smiling cheerfully, with their newly won medals, amongst the large throng of family and friends gathered at the finishing line. The organisers, Tenby Sea Swimming Association, breathed a joint sigh of relief; the swim had taken place; all the swimmers had returned safely; there had been no hitches in the safety systems set up to protect the swimmers and myriad craft operators involved. Everyone was now smiling, a job well done. 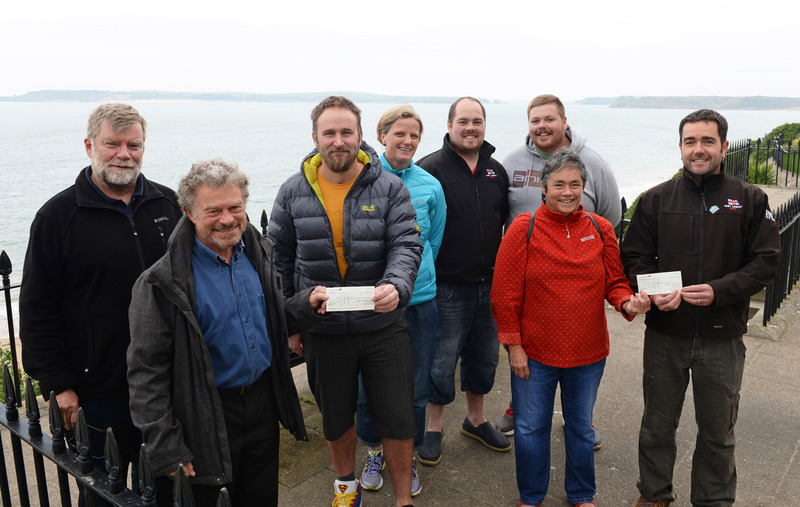 Now to collect the monies, pay the bills and hand over the balance to Tenby RNLI, the beneficiary of the Swim. Four years ago Val Coates Rees, one of the 70s swimmers, asked if the Tenby Sea Swimming Association (organisers of the annual Boxing Day Swim) would consider resurrecting the swim and turning it into a regular annual event within Tenby’s burgeoning Summer Festival of Sport. The Caldey Swim was reborn. In 2013, 50 swimmers made the crossing and in 2014 100 took part. Last year, a summer of changing weather produced a windy, choppy water offer for the day of the Swim. Always acting with safety foremost, the event had to be cancelled. And in the midst of an ever burgeoning Tenby summer festival of sport – think Long Course Weekend, Tenby 10K, Ironman Wales et al – that was it. There was no alternative Sunday when the tides matched the organisers’ criteria of conditions. So, this year’s Caldey Swim, on Sunday 14th August, has an extra, rarity value. And when the three Caldey boats take the 100 swimmers from Castle Beach at 9.45 over to Priory Beach, Caldey, ready for their 10.45 start, many of them, frustrated by last year’s disappointment, will be thinking they are, indeed, special. A special event it is: an open sea swim of about 2.4 miles from Caldey Island to Tenby harbour is a real challenge. So important are the tides, the rip, the wind that the conditions have to be almost perfect for the event to take place. And you have to do it in a long dogleg direction; if you went straight you’d end up on Pendine beach! Eight power craft (ribs & jet skis), nearly 20 kayaks, three motor vessels, a tall masted sailing ship as a marker, a dedicated team of coastguards, specialist medical teams at both ends of the swim, maybe even a lifeboat or two if there are no ‘shouts’ coinciding, Tenby Mayor and Chair of Pembrokeshire County Council to share handing out the medals, athletes’ bottles of water for before and after the swim, bananas for an energy grab on completion, there’s a lot that contributes to a simple, but actually rather complicated event. And let’s not forget the sponsors who kindly help with the costs – Princes Gate Springwater, Big Brum’s Carpet & Furniture, The Port of Milford Haven – who also enable the Swim to raise loads of money for Tenby RNLI. So at 7am on Sunday 14th August, please keep your fingers crossed that the conditions are sufficiently favourable for the organisers to ‘wave the green flag’ and keep them crossed until 10.45 when the swim is due to start. If you’d like to catch the finish, on the far side of Tenby Harbour quay, the first swimmer should arrive at about 11.30, the last by 12.45. You could go out on the spectator boats, leaving from Castle Beach at about 10.25, or simply watch from The Esplanade, Castle Hill, Tenby Harbour or on the beach where they land. You could even join in the congratulatory clapping – the exhausted swimmers will truly deserve your applause.